A garvey hull with a squared transom bow provides more room than conventional hulls and, yet with JIMBO, a generous vee is incorporated. 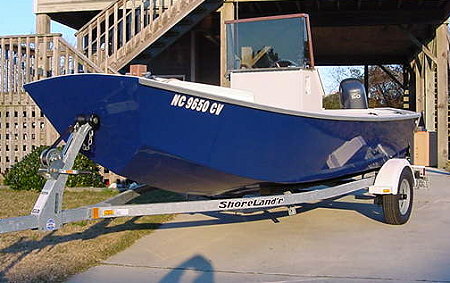 These are rugged craft, excellent as work boats or for the fisherman who wants a boat for fishing, not spit and polish. Sure this type of hull can be as nice appearing as one would wish, but this is a boat to use, not to pamper. The large cockpit with raised sole forward is left open with an optional center console (fully detailed) so you can add bench seats or fishing chairs to suit. The outboard motor area incorporates a self-draining motorwell. There is lots of space under the cockpit area for storage, plus the flat floor has no frame or bulkhead protrusions. JIMBO in ALUMINUM or JIMBO in WOOD share the same hull, but the plans and patterns are separate; these are not plans with one material then "converted" for another. Each version is intended for building in the material designated; WOOD/PLYWOOD or ALUMINUM. The ALUMINUM version features sheet welded stock incorporating a chine spray rail and rugged pipe sheer bumper. The sides are 1/8" and the bottom 3/16" thick with four longitudinal reinforcing beams for extra strength. The hull is built right side up in a simple cradle building form. The side and bottom are fully dimensioned so the usual cut and fit, cut and fit, ad nauseum is eliminated. Cut out the parts, put them in the simple building form, and start welding. For information about aluminum alloys, see this site/Boatbuilding Methods/Aluminum. The WOOD version utilizes sheet plywood planking built by the simple Stitch and glue method. The sides and bottom are fully dimensioned and a complex building form is not needed. Lay out the side and bottom on the plywood, saw to shape, wrap the planking around the single building form, hold the seams together with wire stitches, follow with fillets (glue), and reinforce with fiberglass laminates. Vertical full length longitudinal members are added to further reinforce the monocoque hull. With either version you get a complete set of plans and patterns especially intended for the amateur builder with little or no previous experience.